This year's INNOPROM engineering trade fair in Ekaterinburg has India as a Partner Country. With less than a month before the INNOPROM industrial trade fair kicks off, with India as a partner country, in Ekaterinburg, over 150 Indian companies are preparing to showcase their products, technologies and services in Russia. India and Russia have set a challenging goal for bilateral trade to reach $ 30 billion by 2025, while the target for mutual direct investments between them is $15 billion. Compared to these ambitious targets, bilateral trade stood at $ 9.5 billion in 2014 and decreased by around 6 per cent to $ 9.2 billion in 2015, according to the Russian Export Centre. Hydrocarbons, pharmaceutical and agricultural goods have so far accounted for a major chunk of bilateral trade between the two countries. However, India and Russia are now looking to diversify their import and export flows by placing emphasis on the engineering sector, machinery, electronics and technologies. So this year's INNOPROM engineering trade fair in Ekaterinburg, one of Russia's largest industrial centres, (often compared with the Hannover fair) has India as a Partner Country. This gives an opportunity to Indian companies to discuss business prospects with partners and investors from Russia & the CIS region. 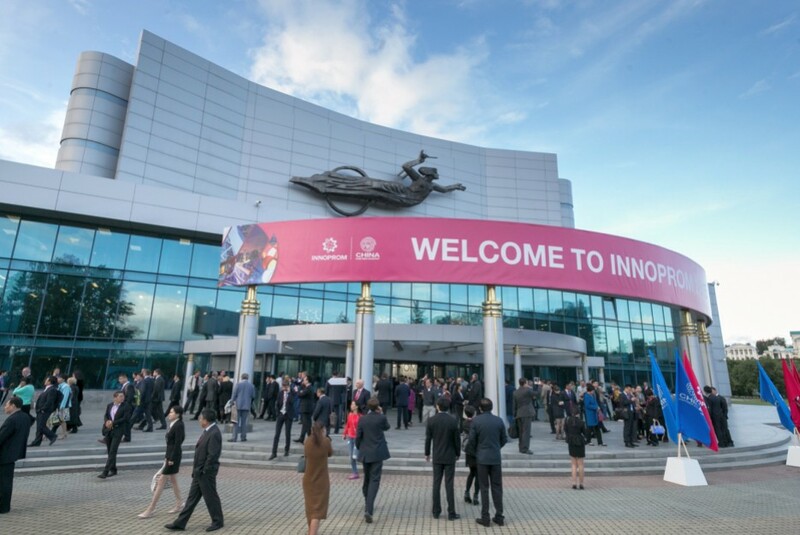 Dmitry Medvedev, Prime Minister of Russia, and Nirmala Sitharaman, Indian Minister of Commerce & Industry, are expected to inaugurate INNOPROM on 11th July. Speaking at an event to promote INNOPROM in Mumbai, organized by India’s Engineering Export Promotion council (EEPC), Sergey Kotlyar, Russian Consul in Mumbai, said, “We are delighted that India was awarded the status of Partner country at INNOPROM 2016 as it is the largest industrial fair in Russia”. Kotlyar said Russia and India have always been privileged to have a strategic partnership and, taking into consideration the geopolitical situation, engineering exports between the two countries had an unprecedented potential. “Russia is reviving the unique opportunity to use its intellectual and industrial potential on internal development of the country. Our emphasis on innovative technologies has already proved to be highly effective,” Kotlyar said, adding that Russia was the only country that has always shared hi-end technology with India and intends to continue to do so in the framework of the “Make in India” campaign. Aman Chadha, Chairman of the Committee on trade with the CIS, believes that small and medium enterprises (SMEs) should drive bilateral cooperation between Russia and India further as they can add significant value to existing bilateral economic relations. EEPC plans to use India's status as partner country at INNOPROM by organizing the visit of around 150 SMEs to Russia, to showcase their products and technologies and help them establish direct connections with potential buyers and partners in Russia. “Last year, China was the Partner Country for this trade fair. However, China was represented largely by government companies while we want to focus on SMEs,” Chadha said. He added that participation in large industrial events across the globe has proved effective for Indian companies seeking to explore new markets, as they can directly discuss and negotiate with potential partners. “India is well perceived in the Russian market as a good supplier of products. I think for us businessmen, perception is the first barrier that we faced. If we have crossed that barrier, it is for us to get to the market and find the right partner to start doing business,” Chadha said. K.L. Dhingra, regional Chairman, EEPC India, said that trade and economic cooperation between Russia and India has emerged as a key priority for the political leadership of both countries. Dhingra said major items of export from India include pharmaceuticals, iron and steel, apparels, tea, coffee and tobacco while India mainly imports defence and nuclear power equipment, fertilizers, machinery, steel and diamonds from Russia. Speakers noted that trade statistics have shown continuous decline over the past few years after registering a growth of 23 per cent in 2011-2012. Bilateral trade in engineering goods declined to $ 1.5 billion in 2015 from $ 2.1 billion in 2012. “If you look at bilateral trade between Russia and India, the data points towards underutilization of trade potential that exists in the two countries. This is reflected in the lower share in each other’s global trade,” Chadha said. According to International Trade Centre (ITC) data, India's share in Russia's total import of motor vehicles is not more than 0.3 per cent, in medical and scientific instruments, 0.2 per cent and in electrical machinery, 0.4 per cent. Industrial machinery, with 1.8 per cent share in the total imports by Russia is the only segment which has a share of over 1%. Experts believe there is huge potential in bringing bilateral trade to a new level by increasing trade in such sectors as motor vehicles, cars, electric power generation and transmitting equipment, medical equipment and instruments and industrial machinery. “What has to be done to enhance trade between India and Russia is increasing of B2B interactions, creating awareness generation programmes on products available in both countries, identifying areas of value chain intergeneration,” Chadha said. India is currently in the process of negotiating a FTA with The Eurasian Economic Union (EAEU) comprising Russia, Belarus, Kyrgyzstan, Kazakhstan and Armenia. This FTA would improve connectivity between the countries significantly, through the North–South Transport Corridor (NSTC) project connecting India and Russia via Iran and Azerbaijan. The new route would ensure easier movement of goods, reduce freight time and costs. “Being an area of vast reserves of natural resources consisting of oil, gas, electric power, mineral fertilizers, coal, iron and steel, EAEU will offer a ready market to enter for India, once the FTA comes to force,” Chadha said. Non-tariff barriers faced by Indian companies in Russia would be removed after implementation of the FTA and the Indian pharmaceutical sector would be the biggest beneficiary. EEPC representatives advised business leaders planning to participate in INNOPROM to prepare marketing material in Russian and arrange a translator for negotiations on the sidelines of the forum in advance. According to the businessmen RIR spoke to, language, difficulties with visa arrangements and frequent issues faced by many Indian tourists and business travelers at the immigration in Russia are some of the concerns they have while considering participation in events like INNOPROM or planning business trips to Russia to explore the market.